These past few weeks my friend Yvonne was gracious enough to bring in some of her family's items for a Día de los Muertos display in one of our cases at TAMUCT. We wanted to do a display that highlighted what Día de los Muertos, or Day of the Dead, is actually about. Día de los Muertos is celebrated on November 2 and is meant to celebrate and honor the lives of those who have passed away. The holiday originated in Mesoamerica but is increasingly practiced in the U.S.
Offerings, known as ofrendas, include food like pan dulce, hot chocolate and dead bread and hand made items like papel picado to name a few. Symbols involved in the celebration can include flowers, butterflies, crosses, photos of loved ones, and sugar skulls, which are primarily intended to delight children. We are so excited about how this case turned out! Yvonne and I posing by our work! We can't wait for students to visit the display and we are hoping to add more photos of loved ones. 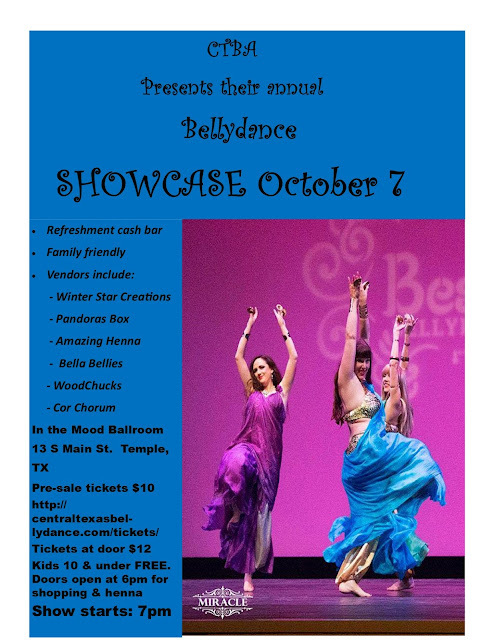 I also wanted to take this time to tell you about a fun event coming up, the Central Texas Bellydancing Association's annual Bellydance Showcase, on October 7th. I'll be attending and hopefully will have some photos of the event to share with you in a future blog post.